Biometric Paying Becoming a Reality? It seems so. A chain of convenience stores in Tampa, Fl have recently installed a biometric payment system that simply requires a push of the finger to pay for your smokes, beer, gas, condoms or Doritos. 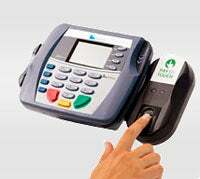 The Coast To Coast chain is the latest business to incorporate this payment system. For the user, you have to go through a simple process registering your fingerprint to the system and linking it to some kind of checking or debit account. The system currently doesn't work with credit cards. Pay by Touch, the company that provides these pay systems currently has units in Virginia, Illinois, North and South Carolina and some other states. Any readers have a chance to try out this system? What did you think? Leave a comment or shoot us an e-mail with some feedback.